Profile: Construction is complete for MD Anderson Administrative Support Building at the Texas Medical Center. The new 25-story building will consolidate tenants from eight different lease spaces, as well as accommodate projected growth and administrative needs. In addition to administrative support spaces the building will also include offices, conference rooms, huddle spaces, and a state-of-the-art conference center. Included in the Mid Campus Building 1 project is the design of a new Tier III Data Center to support the growing demand of data storage throughout the campus and a 2,700-car capacity parking garage (891,000 SF). The Administration Support Building will be the largest building to be constructed by MD Anderson to date. 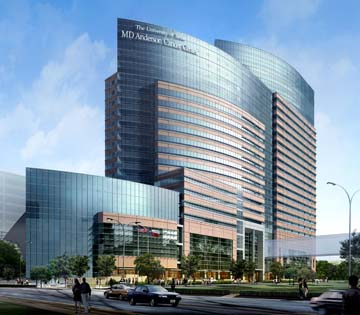 Services: DataCom Design Group was selected to provide MD Anderson extensive professional services for various technologies including the design of IT, security, and audiovisual. DataCom Design worked closely with the MD Anderson IT staff to develop current technology standards for the campus that will be the bench-mark for all MD Anderson projects in the near future. Our effort included the technology verification of IT systems and services, extensive security design and commissioning, as well as IT, CCTV and surveillance for the parking garage. DataCom Design assisted the Design/Build team in developing the technology approach, communication layouts, and construction budget for the technology project.